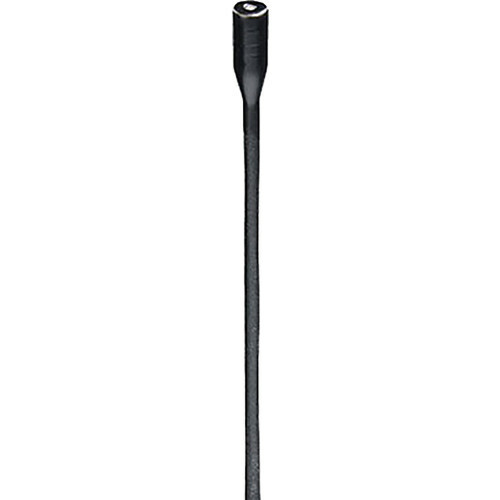 The black B6 Omnidirectional Lavalier Microphone, Very Low Sensitivity, with Detachable 4-Pin Hirose Connector for Sony Wireless Transmitters from Countryman is a very small lav microphone measuring one tenth of an inch in diameter with changeable protective caps, which provide moisture resistance and color options. The mic can be used to capture audio for theater, broadcast, churches, and general lavalier applications. Built with a low handling noise and rugged construction, the B6 lavalier microphone can be easily hidden in hair or on costumes, or taped to a performer's face. The aramid cable and ultra-thin diaphragm deliver a natural sound while its tiny size makes the B6 easy to position for ambient noise and feedback rejection. The B6's cable terminates to a 4-pin Hirose connector for direct connection to a Sony WRT-8B, WRT-420, or WRT-822B wireless bodypack transmitter.